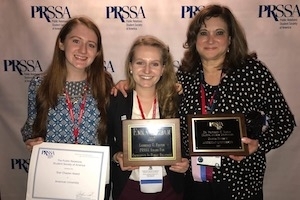 Madden McDonagh (left) holds AUPRSSA's Star Chapter Award; Emma Ingram (center) received the Lawrence G. Foster Award for Excellence in Public Relations; and Professor and Advisor Gemma Puglisi (right) holds the chapter's Diversity Award. 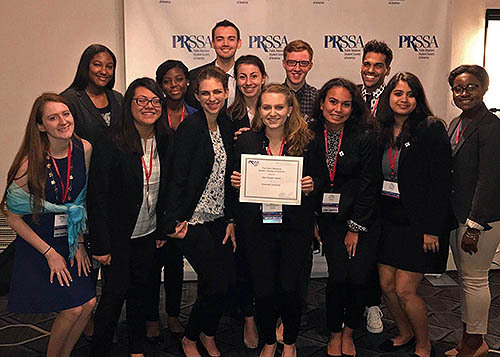 On October 6, 2017, 13 members of American University's PRSSA (Public Relations Student Society of America) chapter flew to Boston for the 2017 PRSSA National Conference. The next five days were full of learning, networking, awards and professional development. As President of AU PRSSA, I oversaw all stages of the venture, from travel to ensuring that everyone's experience while there was exceptional. Preparation for Conference began this past May when I began publicizing it to engage members. In past years, our chapter had sent anywhere from five to 10 students, however, I was determined to send our largest group. By the end of summer I had reached thirteen participants. Our faculty advisor, Gemma Puglisi and I were thrilled to have so many students interested in attending. By end of September, our fundraising efforts, to alleviate costs for members, had come to an end and final payments were made. We hosted a potluck in the weeks leading up to Conference so everyone was able to meet one another and start bonding. In addition, we began gathering supplies to participate in the annual service initiative at Conference. This year PRSSA partnered with was Rosie's Place, a women's shelter in Boston. Chapters were encouraged to bring sanitary and hygienic items for the shelter. With thirteen attendees representing AUPRSSA, we were able to gather many items to donate. Before we knew it, Conference was here! After a very early flight to Boston, our group spent several hours exploring the city. We visited Quincy Market and Faneuil Hall as well as the Boston Commons and Boston Public Gardens. That evening was the opening ceremonies of the Conference, which was fittingly themed, "Take Me Out to the Ball Game". There was dancing, music, food and free goodies! The next four days were jam-packed with brilliant speakers, engaging sessions and fun networking. Some of the highlights included attending a keynote with documentary filmmaker Morgan Spurlock as well as hearing from Judy Smith, (WCL/JD '86), better known for the inspiration behind the hit ABC show, Scandal. Sessions covered all areas of the PR field including sports, fashion, crisis, corporate and more. Students were able to attend sessions that appealed to them in order to help them grow personally and professionally. On the last evening of the Conference, the Awards Ceremony was held. Every year, PRSSA students and Chapters are encouraged to apply for awards and scholarships. This year our Chapter was very successful in both categories. We were acknowledged as a Star Chapter for the third year in a row. In addition, we won the Dr. F.H. Teahan Chapter Diversity Award. This award recognizes outstanding commitment to diversity within PRSSA. Lastly, I was presented with the Lawrence G. Foster Award for Excellence in Public Relations. My recognition included a plaque and award money. Our Chapter is extremely proud of the recognition we received this year at Conference. It is the countless hours of work and dedication that all 110 members put into this organization that resulted in our great success. We also would not be where we are today without the mentorship of Gemma Puglisi, our amazing faculty advisor. Our Chapter looks forward to growing in the following years and gaining more recognition at the National level. We're already counting down the days until next year's Conference in Austin, Texas!